Order to search all cells and prisoners. Shakedown is an Emergency command that the player can use to maintain order in their prison. Its primary function is to command all of your available Guards to search everything in your prison that is capable of carrying contraband (food, furniture, inmates, etc.). Contraband that is found that cannot be directly linked to a prisoner (such as being smuggled into food) cannot be blamed on anyone; however if contraband is found in a prisoner's cell that prisoner will be punished even if they are not there. 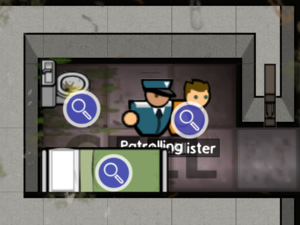 Keep in mind that frequent shakedowns can irritate and annoy your prisoners as they will either be unnecessarily searched or handcuffed, so unless you have your prisoners highly suppressed it is a good idea to use Shakedowns only if you believe high quantities of Contraband are being hidden. Guards will contribute in the shakedown and may neglect their other duties, causing a disruption of normal prison activity, therefore it is best to start a shakedown at sleep regime time. The moment you push the Shakedown button, the overlay for the emergency will appear as seen in the image above. All prisoners and their cells, as well as all objects that can be used to smuggle contraband, will get tasked with a search job to which a guard must fulfil. However, if you feel that prisoners are getting too pissed off, or if the shakedown is taking too long, the player can click on the button again to end the shakedown. As seen above, the overlay will inform you of how many places must be searched in order to complete the shakedown. The green bar represents successful searches, the dark orange bar represents guards arriving to location or in the middle of a search, and the dark red bar represents searches yet to be assigned to a guard. Once all places are searched, shakedown ends. The overlay will also inform you of the different types of contraband found. Hovering your mouse over the icons will tell you what they are (the image above shows a spoon, poison, and piano wire being discovered.) The list will get populated as new contraband is found, and a number will get appended to contraband that is found multiple times. The contraband counter will include any contraband found earlier that day, too. During a shakedown, prisoners are not confined to their cell and are able to move about freely if your Regime allows them to. Only if contraband is found on a prisoner or within his cell will they receive punishment (lockdown or solitary) according to your Policy. Any prisoners digging a tunnel while a shakedown starts will return to their cells reducing the chance of the tunnel to be exposed. This page was last edited on 10 March 2017, at 06:07.